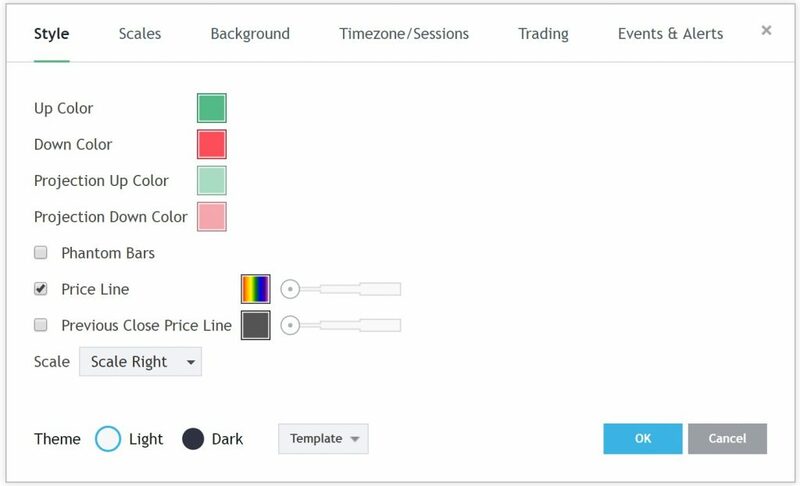 TradingView Blog / Charting / Range Bars are Now Available on TradingView! We are happy to introduce this highly demanded chart type to our users. 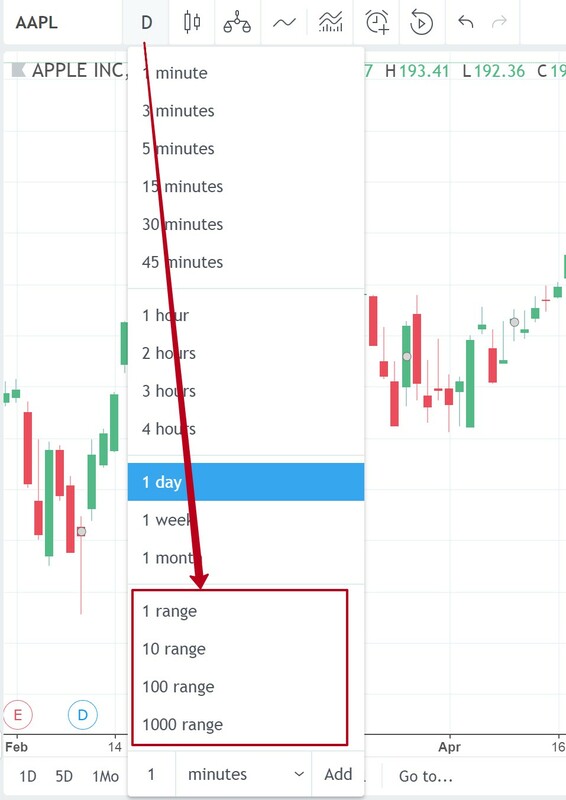 Range bars are quite unique since they allow the user to analyze price movement of the financial instrument, while reducing market noise. Range bars don’t take time into consideration and are therefore able to create the so-called clean chart effect. A new bar is formed when price reaches a certain value set by the user. As you can see, this approach is quite different from the usual one as it completely eliminates the time factor. How are the Range bars built? Range bar has an opening price (Open). 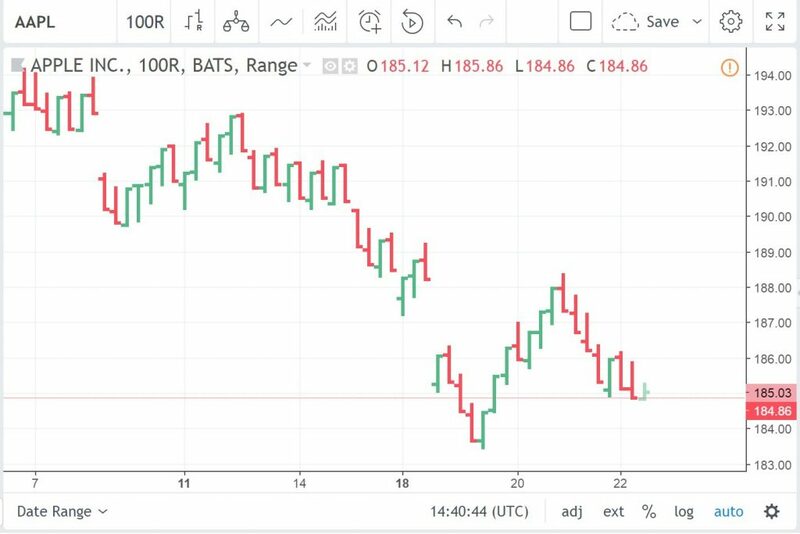 The price movement is recorded when the bar is being formed. During that time the size of the bar is growing from the Open point either up or down, depending on the price. The difference between the highest (High) and the lowest (Low) bar value is considered as price movement. Whenever the High – Low point reaches the Range interval, the formation of the bar finishes. If the price moves in the [Low, High] range, the closing point (Close) of the bar changes. When the price crosses the [Low, High] range, the bar closes and the new bar starts to form. How to select the Range bars on the chart? 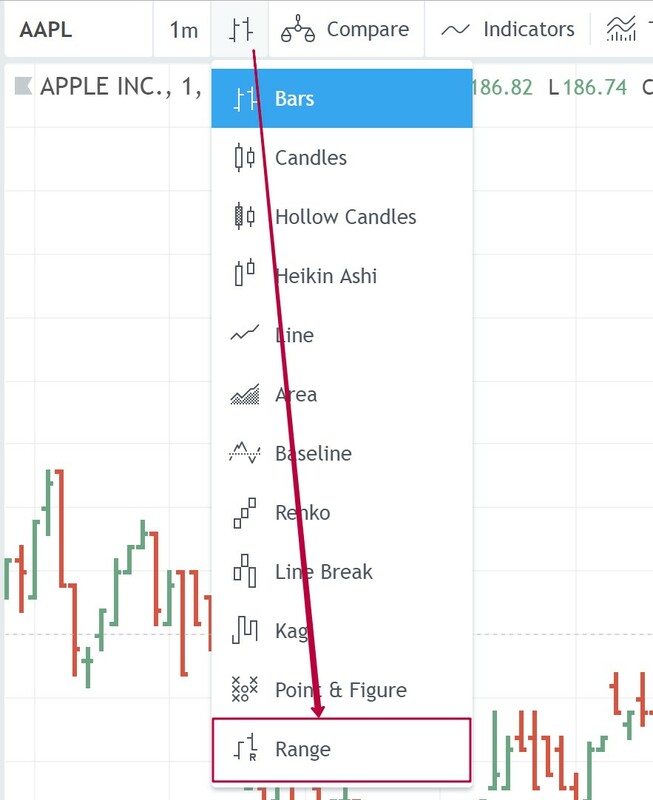 Select the Range bars in the chart type menu at the top of the chart panel. Select the Range interval in the interval menu at the top of the chart panel. What does the Range interval mean? The Range interval sets the range in which the price moves, which in turn initiates the formation of a new bar. 1 Range equals to one minimum price change. This value can be presented with the following formula. The values Min Move and Price Scale are displayed in the Symbol Info menu (Right click on an empty area on the chart > Symbol Info…). Please note that the time parameter does not affect Range bars, therefore when you choose the Range chart type, the interval of the chart will be automatically switched to the Range interval by default or to the last used Range interval. What settings are available for the Range charts? Up Color – set the color of the up bar. Down Color – set the color of the down bar. Projection Up Color – set the projection up color. Projection Down Color – set the projection down color. *Projection Bars – bars that are built based on the data of a temporary bar that is still forming. *Virtual Bars – bars that are built in price ranges which were not traded. Price Line – the display setting of the line that shows the last price. Previous Close Price Line – the display setting of the line that shows the closing price of the previous trading day. The set of 1 minute interval bar values (Open, [High, Low], Close) are the source data for the Range bars. Customizable (other than predefined) intervals are available to users on a paid plan only Pro Plus or higher. The interval needs to be more than 10 Range to be able to publish an idea that is based on range bars. The Bar Replay is not supported for Range bars.